Grohl made his name sat behind the drums in Nirvana of course, but these days he fronts Foo Fighters, a bands he's led to platinum-tinged success. 2011 is likely to be the year the band returns after the side-projects of various members, not leash Grohl's own dalliance with the amazing Them Crooked Vultures. 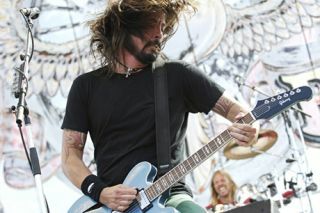 Grohl's Gibson Custom Shop 'Inspired By' DG-335 model is long sold out...and Guitarist never even got our hands on one!